This is Habibi. Pure Coton de Tulear straight from Madagascar. Some generations ago at least. He was a Royal lap dog and if you weren't a Royal - well, you simply couldn't have a Coton. More's the pity. Habibi is my co-pilot on the journey. We've been together since September of 2008 and his birthday is July 8th. Yep, he's a Cancer. I'm a Leo. Actually a double Leo with Leo rising in my birth sign. (Double trouble I believe it's called.) Habibi literally means 'my beloved' in Arabic. It's a common term of endearment which I thought suitable for any little entity I was about to share my life with. The Moores of course, made their mark on Africa. Some of the more common words filtered into the native tribes, Habibi being one of them. Therefore, I thought it fitting. Before Habibi, there was Rissie, or Lorissa as I called her when she was naughty. Her registered name was Touchstone Walking on Sunshine - and she was every bit of that. Her English Setter body was exquisit. She held her head high and pranced when she walked. She turned peoples heads. It felt good to walk with her because somewhere along the way, I had stopped turning peoples heads. It was fabulous to have a head or two swivel in my direction even if it was to look at my gorgeous canine companion. Rissie was literally a gift. After attending a retreat in '98, the facilitator said to me, "I have a gift for you. It's a dog. You need each other. She will teach you many things." A few weeks later, Rissie arrived on the plane after a long journey from California. We were together for 11 years and she did in fact teach me many things. Most of all, she taught me to 'be in' and enjoy the moment. Dog's do that, don't they? She taught me that stretching feels wonderful and to be happy to see your friends. A hard one for me to learn: when someone gives you a treat, receive it with grace, gratitude and druel over it. No more do I say, 'Oh, you shouldn't have, or You didn't have to do this for me'. She taught me it's a gift to show someone you love them. The day Papa passed, Rissie lay by him all day. When the funeral home came to take his body, she lay across the door of his bedroom. I literally had to move her gently out of the way. She was something! Two years after Rissie crossed over I began researching breeds. I knew I had done so much 'down sizing' myself, the breed of dog I chose had to be down sized as well. I actually wasn't sure how I felt about small dogs. Not enough to hug? 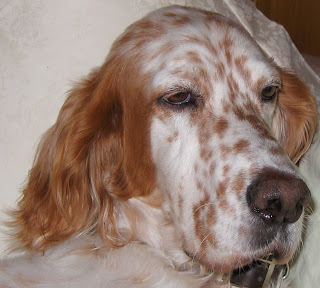 I wanted a lap dog who was not yappy, was laid back, loved to cuddle, did not shed and was hypo allergenic. I looked seriously at poodles and almost fell for a standard ---- that was a close call - they are huge! It was tempting because they prance and I do adore prancers. Moving on, I looked at Bichons, Havernese, and a string of other small hypo allergenic types. I happened upon Cotons and fell in love. Cotons are still a fairly rare bread in Canada and even in the US. I searched all over the place and found them very expensive in Canada. Then I happened upon two women in Idaho who raise them. After much e-mailing and phone talking, my girlfriend and I made a fabulous road trip through the beautiful fall country side to pick up Habibi. I chose Habibi because of the sparkle in his eye. His brother had that glazed over, relaxed look and is in all probability swinging in a hammock somewhere snoozing. Habibi, on the other hand is AWAKE! He is sassy and charming and loving. He is intelligent and wishes more than anything in the world he could talk. He can outstare me! The very first time I picked him up he began 'kissing' me - and hasn't stopped since. It's not part of the breed, however, this seems to be part of the way Habibi expresses himself. I don't mind. He is a cuddler and loves to snuggle into my neck. He is now my co-pilot. He's a good traveler and loves life. He's teaching me not to miss anything - it may be important. If you want to see some wonderful photos of Cotons, please go to http://www.mydarlingdogs.com/. This is where I found Habibi. Glenda and Cindy are amazing women.